On October 29th a special Google Event could bring us some very interesting news. 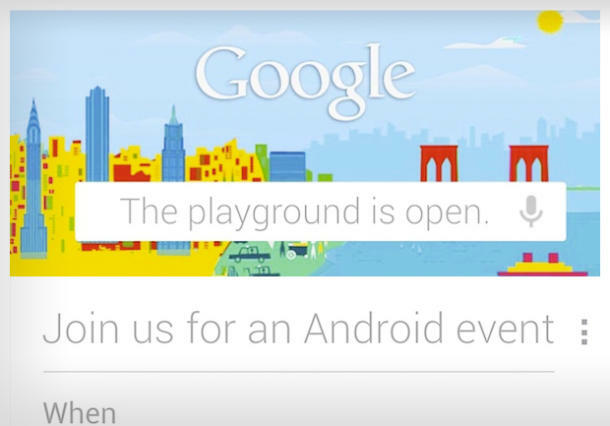 The Google Event is said to be the playground for many major announcements such as Android 4.2. We may also see the Nexus 4, a 32GB Nexus 7 and maybe even a new lower-end Nexus 7. There is also supposed to be a Nexus 10 shown off. While the introduction of the 32GB Nexus 7 is merely about replacing the 16GB model, we see some more exciting things coming our way with a Nexus 10 and Nexus 7 lower-end variant. A cheaper (maybe $130-$160) 7-incher could be really interesting with the iPad Mini on the way. It is hard to say what a device would look like, or what they would do to lower the costs– perhaps only 4GB of RAM and a slower processor than the Tegra 3? Even more exciting is the idea of a 10-inch Nexus tablet. Such a 10-inch device could really give Apple a run for its money if it is cheaper and still has comparable specs to the iPad. If we had to take a guess, I’d wager that Google will launch such a tablet around $300-$400 with specs slightly above the iPad 2 and slightly under the 3rd generation iPad. Keep in mind that is just speculation. If you haven’t heard of the Nexus 4, it is basically the LG Optimus G in new clothing. It is also rumored to be only one of many Nexus smartphones eventually making their way to market. Needless to say, this event is going to be big. What do you hope to see from Google? Will the new announcements spell real trouble for the iPhone and iPad lines?